An applicant applies for a job in various companies simultaneously. There are situations when he has to choose between the various options available or he has to leave the job because of certain other reasons like the other job is more attractive or his health issues are not allowing him to do the job. For this he has to withdraw job application from the company from which he wants to leave the job. Withdrawal of job application means to inform the organizational heads in which the applicant has applied, to not continue with the process of job selection once he has been selected for the interview. In case the application has not been selected for the interview then there is no need to withdraw application letter. Both the applicant and the employer have a little or limited knowledge about each other till the time they face each other in an interview. The information that is provided in the applicants form and the details that are given in the job description are totally limited and may decline once the process is taken further. So, it is better to answer the following questions and decide. What new information have you learned that has declined your interest in the job that has been offered? How much of your interest has been developed on the job? Does this job move is correct for your career development? Is there any other information that could have changed your mind or will change your decision later? If the answer to these questions are in a negative direction, then it is always better cancel job application at once without wasting the time and effort of the company officials. By doing so, the applicant will be able to choose for the best job for himself and will avoid to waste his time. 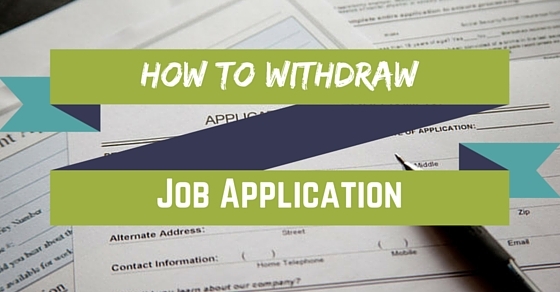 There are certain ways in which an applicant can withdraw his job application. Listing some of these might help an applicant if he wants to withdraw the application in future. The applicant can always inform the employer about his decision that he will not be able to continue with the job procedure and also state the reason for doing so. The applicant may state that the job was not properly fit for him and if the employer is impressed with the applicant’s profile, then he may redirect him to some other job as well. If the applicant is in good talking terms with the HR of the company in which he wants to leave the job, then it is always advisable to make a call personally. This can help the applicant to restructure the job. If it is not possible to get in direct contact with the HR then the applicant can leave a voicemail with the reason for leaving the job. Conversing with the boss personally will give a chance to make the applicant present his situation in a better way. It is always advisable to remain in employers good books because there are always other job opportunities that the company has to offer. When a candidate applies for a job and takes into consideration certain aspects such as salary, perks,and his career prospects in the future, there may be certain doubts which he needs to get cleared when called for an interview. So, the interview is that phase where both the employer and the applicant clear all their doubts. But sometimes after submitting a resume a candidate after doing possible search about the company may like to withdraw his application from the interview phase. Another important reason that a candidate may state is that after doing research about the company and its future growth prospects, he has realized that there is no match between them and he cannot identify his own growth with that of the company. Whenever there is a job interview the candidate shall always state the other companies for which he is interviewing alongside. In case, the candidate gets the job, then he can clearly state his reason for the withdrawal of interview application. A candidate might be planning for relocation when he has submitted his resume, but the relocation might not be possible because of certain reasons and thus there is no point in appearing for the job interview. However, it is not necessary to give a reason for not appearing for the job interview and to keep the letter or email simple is the best way because in the near future the candidate may have to apply again in the same company. Sometimes, there may be a situation where a candidate applies for a job, gets selected, resign from the previous job and is going to join the new job in a few days time. But, when the employer inquires about him, he gets to know certain facts and as a result he withdraws his offer. Now, in such a situation the candidate is left unemployed and is nowhere to go. The angry candidates decide to sue the employer. But the question is, Is the employer actually guilty? The employer may clearly state that he has technically never hired the candidate and also the employer is ‘at will’ employer so he is actually not guilty. In such a situation the candidate can file a legal suit against the employer on the grounds of fraud, breach of contract, misrepresentation, promissory estoppel, discrimination and so on. Under the breach of contract, where the contact may be verbal or written, the employer can always alter the words used and can face the legal consequences. Whereas, under promissory estoppels if the promises are violated on the behalf of the employer then he will have to face the burden till the value it has been suffered by the applicant. For example the candidate in order to join the job the applicant has changed his kid’s school or has shifted his apartment or has suffered any kind of loss depending upon its value. If the candidate feels discriminated because his job has been given to someone out from the protected class, then he can sue the employer. In the ideal world the employer offers the job to the candidate after doing all the possible checking of personality, background checking and so on. So if the employer sends a job withdrawal application to the candidate, then he has to look into the consequences. But, to play safe the employer while sending the job letter must state that it is tentative and not a contract to bind. Also, the clauses in the contract are at will and can be changed till the final contract. Finally, it is always better to offer the job once the employer is completely satisfied with all the aspects relating to the job. But, if the employer at any stage decides to withdraw the job application, then he should inform the candidate at once so that he can make the changes if any required. If the candidate has chosen job offer, but not yet joined and in the meanwhile, comes the other job offer which he wants to join, then here the candidate is stuck in the dilemma as to what to do? 1.Can a candidate switch between the jobs? Mostly it is legal to do so, however, it is also unethical on the part of the candidate. Signing an offer acceptance letter is not similar to signing the legal contract with the company. Whenever the candidate changes his mind about the job acceptance he should at once inform the hiring officials about it and should ensure that no legal steps are taken against him. But, if the candidate has signed the legal contract then he can only explain his situation to the officials and ask them to release him from the contract with all the necessary legal formalities being done. If the hiring company agrees, then all is fine, but if they disagree then the candidate has to fulfill all the terms of the contract. 2. How to go about it? The candidate shall inform about his decision to the hiring manager at once because they have till now declared that the job offer has been accepted. The company might have incurred expenses in this direction by printing visiting cards or renovating the cabin according to the candidates taste and if then the candidate refuses, he will not appear in the good books of the company and also the hiring manager. The candidate must talk to hiring manager personally and try to be as apologetic as he can be. Try to explain your situation and convince them not to take any legal steps against him. 3. The drawback of withdrawing the job offer? One of the major drawbacks of such an act by the candidate is on his reputation. In the business world all the related firms work in a closely connected network of the officials. Once the candidate creates the reputation which creates his bad picture in the business world he might have to suffer forever. The candidate might not apply or get jobs in the firms that are in touch of the present firm. A worse situation may appear when the candidate appears for the interview, but have to face the same hiring manager then his chance of getting the job are further worsened. 4. How to avoid such situation? In the first place the candidate shall avoid such a situation to occur. Whenever a candidate accepts a job offer, then he shall inform all the other companies in which he has interviewed that he has accepted the job offer so he should not be considered as of now. If the candidate is expecting a job offer from the other company then he shall ask the hiring managers about some time, so that in the meanwhile he can decide from all the jobs that has been offered to him. The candidate should plan the things to avoid any kind of consequences later, which he has to regret. A letter of withdrawal from the contract is the official and formal document that signifies that the candidate is ending his relation to the company. If the candidate is not able to join the job after accepting it, then sending a letter of withdrawal will be treated as an act of courtesy. The letter of withdrawal can be used in a number of scenarios like job termination, while leaving a school or college or in ending a medical care and so on. How to write a letter of withdrawal? Be polite in writing the letter even if the situation in which the candidate leaving is not positive. The letter shall be written in a professional manner. Clearly state the date when the relationship with the company will be over. State the reason for withdrawal. The candidate must thank the company and especially the hiring manager for understanding his situation and allowing him to leave. Thus, the candidate before entering into any contract with the company properly has to make up his mind and go through the job details well in advance to avoid any further consequences. As it can affect his reputation and goodwill in the business world which can be harmful to him in the future.